Around a year ago, we interviewed Benjamin Laukis, a world renowned tattoo artist and first class watch geek on his horological journey. If there are two things we know about him, it’s how amazingly talented he is in his field of work and how obsessed he is with watches. We recently caught up with Ben to see how his collection has evolved – a follow-up on the state of his collection, if you will (spoiler alert: A LOT has changed since our last correspondence). Before scrolling further, we highly recommend that you read up on our first interview here to find out more about how Ben started as a watch collector and his collection from a year ago. We would like to thank Ben for participating in this follow-up interview. 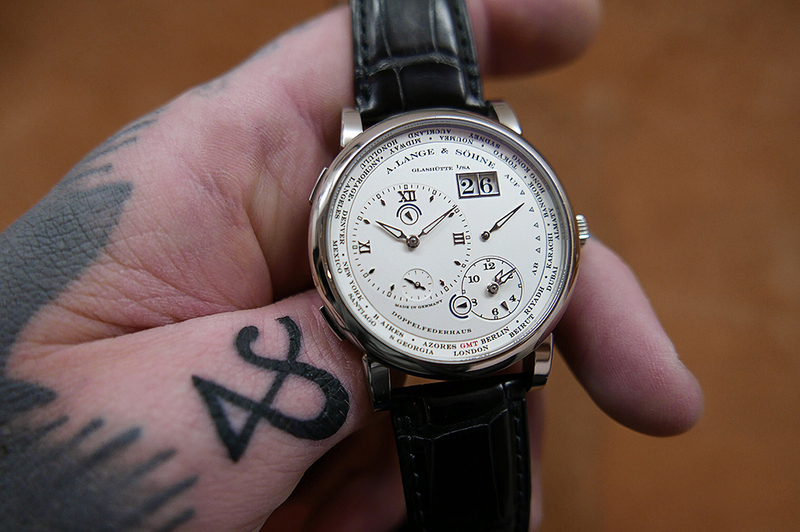 Tattooed on Benjamin’s thumb is the Lange ampersand, and next to it, the Lange 1 Time Zone in white gold. Photo by Benjamin Laukis. The state of your collection during our interview last year was impressive, not to mention diverse – can you remind us of what was in your collection back then? The state of my collection has transformed dramatically over the past year. Some pieces popped up from friends that I couldn’t refuse, which meant letting go of others and shifting things around. At the time I had four watches in my collection: the Rolex Deepsea D-Blue, Panerai 213 split-chrono, Audemars Piguet 15400 Royal Oak and the A. Lange & Söhne Lange 1 Time Zone. They are all beautiful pieces, but as every watch collector knows, tastes can change and new opportunities can have you selling your favourite piece to fund the next. Class of 2016. From left to right: the Lange 1 Time Zone, the Royal Oak, the Rolex Deepsea D-Blue, and the Panerai PAM 00213. Photo by Benjamin Laukis. What is in your collection now? My current collection consists one single serious mechanical watch, the A. Lange & Söhne Datograph Pertpetual, and accompanied by a G-Shock Rangeman for a bit of fun since the Datograph is not something I would take swimming. The new guard. 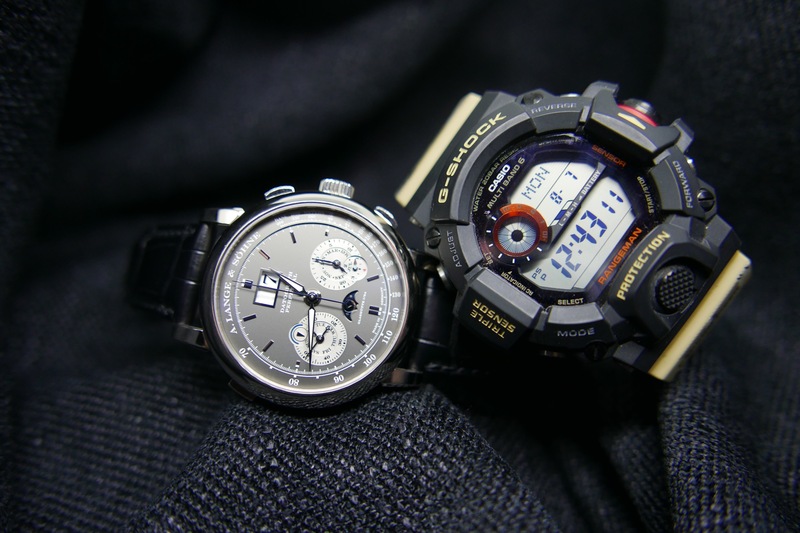 Benjamin has now consolidated his collection into just two timepieces: the Datograph Perpetual and the G-Shock Rangeman. Photo by Benjamin Laukis. That is quite the transformation. Can you share with us the thoughts that have led to the evolution of your collection to its current state? “Consolidation” is a term thrown around a lot within collector groups, but not many (that I know of) have actually taken the plunge into a single piece collection. Since we last spoke I sold some pieces to fund the mighty A. Lange & Söhne Zeitwerk that had become available through a friend, so at short notice I jumped at it. It’s a stunning piece both visually and from a mechanical standpoint. 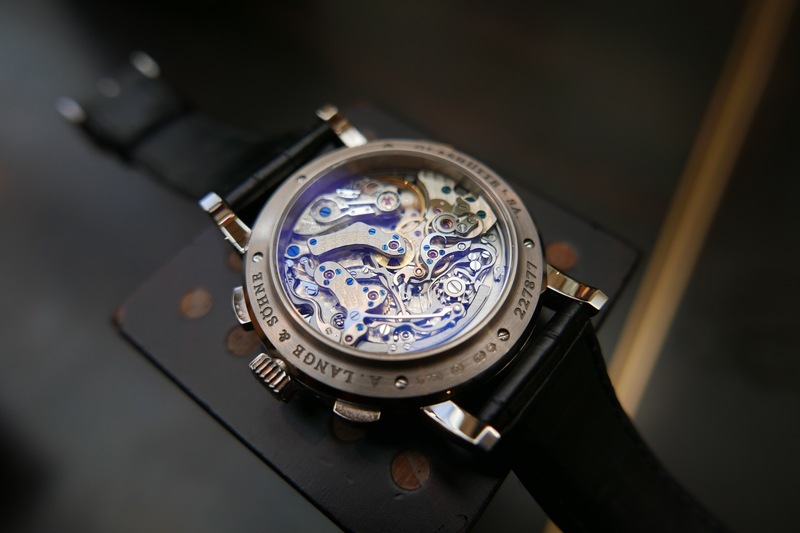 But not long after, I had a piece offered to me that I had previously thought unobtainable, the Datograph Perpetual, and after some thought I realised if I moved all my pieces into one, I could obtain this amazing piece. I think for any collector, owning a perpetual calendar chronograph from a top tier brand is a dream; it’s to me, the king of all complication combinations. Although not the most technically sophisticated, it really demands attention from any true collector, and also being from my favourite manufacture, I had to make it happen. The fact that I kind of live on the road at the moment with my work makes life a little easier only having to worry about the watch on your wrist and not of the others in the hotel safe. The consolidation was a nerve-racking experience, but I do not regret it in any way. I love everything about my Datograph and I can eventually build my collection back up when the time is right. Cutting the collection down to just two timepieces was a nerve-racking experience for Benjamin, but there are no regrets as it led him to his dream piece: the Datograph Perpetual. Photo by Benjamin Laukis. 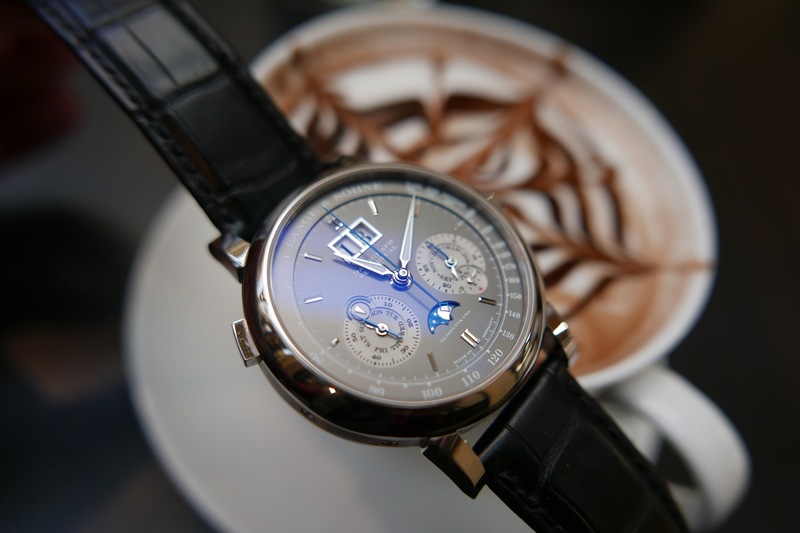 Can you tell us more about the Datograph Perpetual and what drew you towards it? The Datograph Perpetual could not have been designed any better in my opinion; while keeping the aesthetic of the original Datograph (probably my favourite watch of all time if I was pressed to choose) they managed to add a perpetual calendar without making it too cluttered whatsoever. The Datograph Perpetual boasts immense complexity while maintaining the iconic twin-register/outsize date design of the Datograph. Photo by Benjamin Laukis. The Ref. 410.038 with grey dial, silver sub-dials and white gold case is perfect for me, as well as sporting one of the most coveted chronograph movements in history. It flies under the radar quite easily and wears well as an everyday piece but also holds its own with a suit and tie without a doubt! 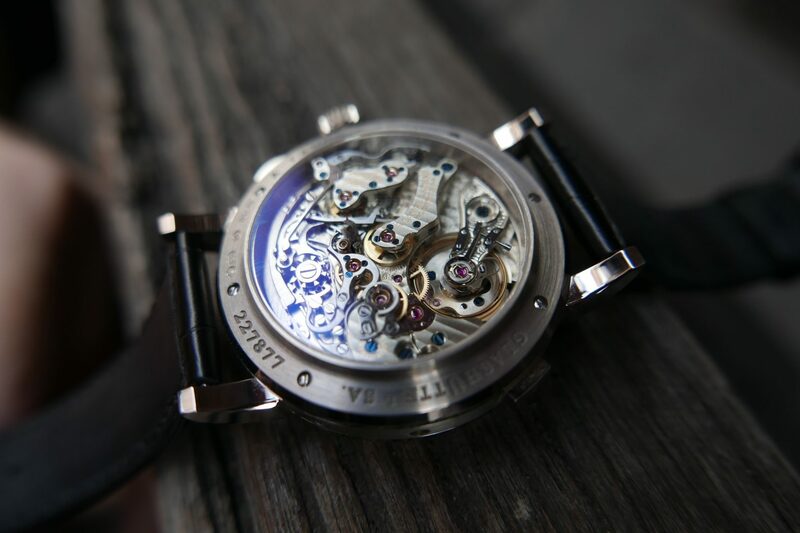 There isn’t a greater sight in all of horology than the caseback of a Lange Datograph. Photo by Benjamin Laukis. Have you experienced any seller’s remorse at all from the sale of your Rolex Deepsea, Panerai 213, Royal Oak or Lange 1 Time Zone? I loved all of the pieces I moved in order to get the Datograph. I was quite fond of the Zeitwerk and sometimes I miss the Deepsea, but I still don’t regret my decision. I will most likely add a Rolex back into the collection as I’m missing a piece I don’t have to worry about and can also swim with. The Rolex Deepsea is a charmer even when peeking out from a dress sleeve. It has since been sold to fund new pieces, but Benjamin intends to add a Rolex back into his collection in the future. Photo by Benjamin Laukis. Which piece(s) are you currently eyeing to add to your collection? Since the Datograph Perpetual, my love for grey dials has increased dramatically. I thought a grey dial collection theme could be an interesting and challenging approach to rebuilding my collection, as well as matching my wrist and most of my wardrobe perfectly. The new Rolex Datejust 41 grey dial on jubilee is a hot contender for my next watch, some others on my radar are the Audemars Piguet Royal Oak Offshore “Elephant”, the Patek Phillipe 5205G black/grey dial and possibly even an F.P. 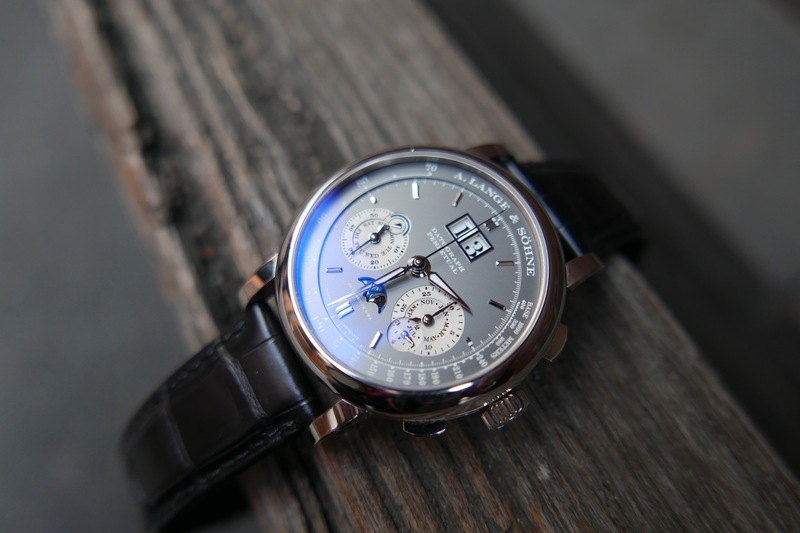 Journe Resonance – in a grey dial of course. Only time will tell – who knows what may take my fancy in a year or two? Benjamin loves his grey dials, partly because they match the colour of his wrist. Photo by Benjamin Laukis. 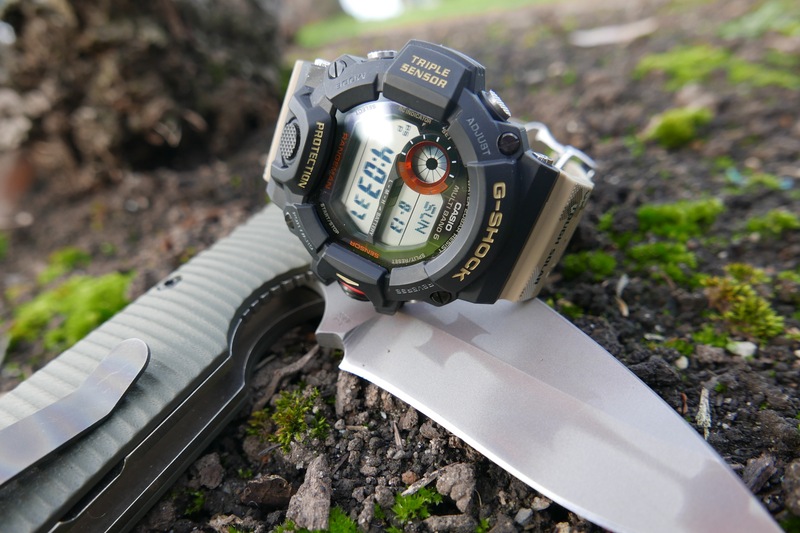 Last but not least, do you have any sage advice for those who have only just begun their descent down the slippery slope that is watch collecting? 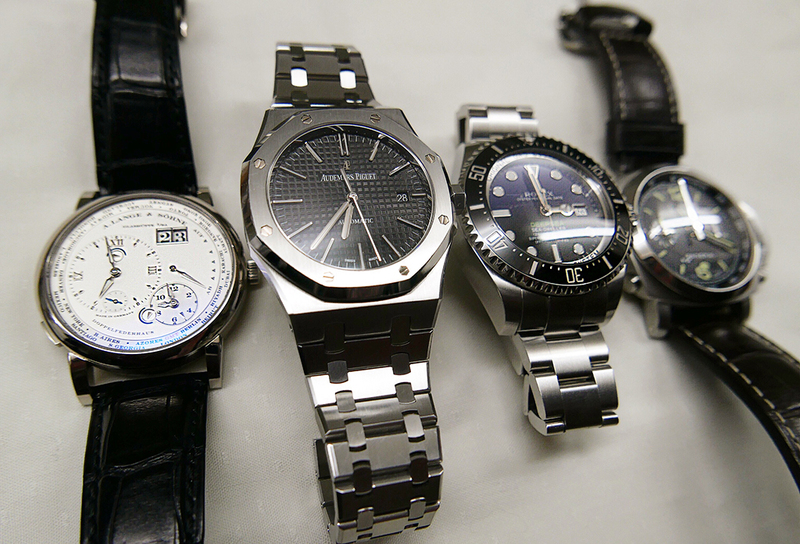 Watch collecting, like many similar hobbies, can be a consuming pastime. 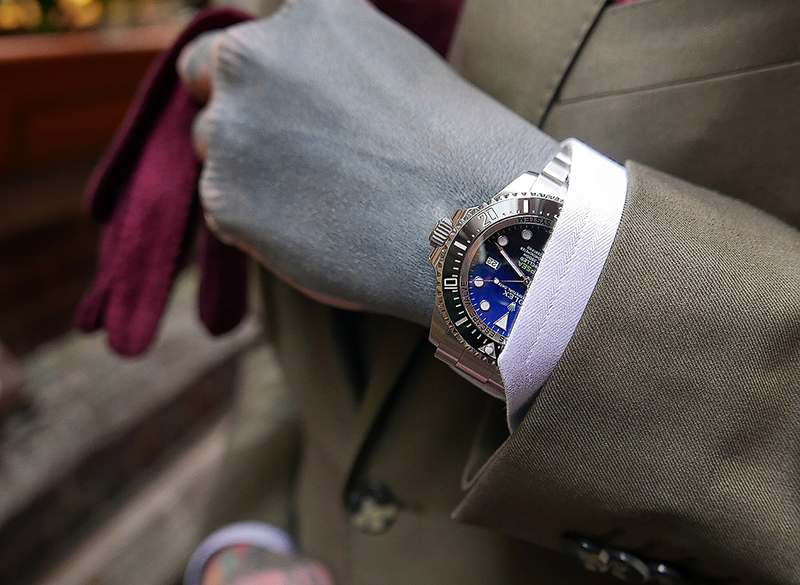 I love to look at watches, discuss them, photograph them, wear and admire them. My advice for someone looking to collect watches is to do your research, join groups (online or real world) and meet like-minded folk and gain knowledge and information that can aid in a wise purchase. Always buy for yourself, not to impress others or for an investment – purchase for the love and appreciation of horology itself. Thank you to Deployant for the opportunity to share my views and small collection once again! 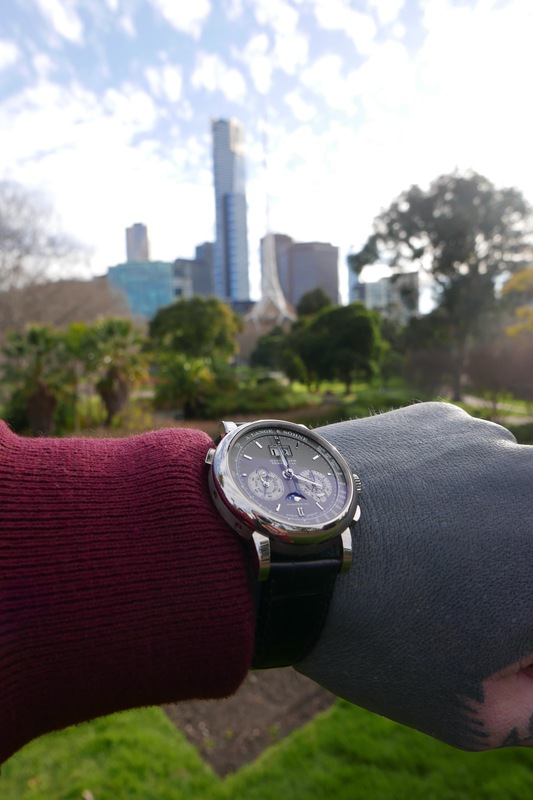 The Datograph Perpetual on Benjamin’s wrist basking under the winter sun of Melbourne. Photo by Benjamin Laukis.